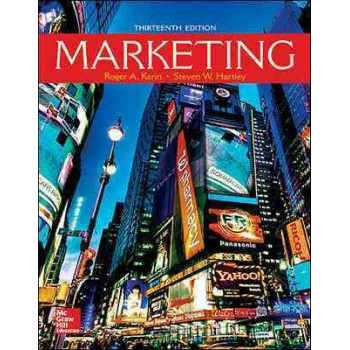 Kerin/Hartley's Marketing 13th edition is the most robust Principles of Marketing solution available to meet the needs of a wide range of faculty. Marketing focuses on decision making through extended examples, cases, and videos involving real people making real marketing decisions. The author team's decades of combined experience in the higher education classroom continue to inform the title's innovative pedagogical approach. Marketing is known for its conversational writing style, ability to engage students through active learning techniques, and vivid descriptions of businesses, marketing professionals, and entrepreneurs in cases, exercises, and testimonials that help students personalize marketing and identify possible career interests. Powerful tools like Connect, SmartBook, and the regularly updated resources at www.kerinmarketing.com make this 13th edition of Marketing the best choice for instructors seeking a rigorous, comprehensive program with balanced coverage of traditional and contemporary concepts. Kerin/Hartley's Marketing is also available through McGraw-Hill Connect(r), a subscription-based learning service accessible online through personal computer or tablet. A subscription to Connect includes the following: SmartBook(r) - an adaptive digital version of the course textbook that personalizes the reading experience based on how well students are learning the content. Access to homework assignments, quizzes, syllabus, notes, reminders, and other important files for the course. Auto-graded assignments in Connect Marketing include iSeeIt! concept animations, video cases, and other application exercises that challenge students to apply concepts and examine how firms analyze, create, deliver, communicate, and capture value. Contact your Learning Technology Representative for a complete list of assignments by chapter and learning outcome. Progress dashboards that quickly show students how they are performing on assignments, with tips for improvement. The option to purchase (for a small fee) a print version of the book. This binder-ready, loose-leaf version includes free shipping. Complete system requirements to use Connect can be found here."